The Sentencing Amendment (Abolition of Suspended Sentences and Other Matters) Bill 2013 was introduced last month. The explanatory memorandum is available here; the second reading speech here; and the Charter statement of compatibility here. These are the default times, and can be proclaimed to commence earlier. The complete removal of suspended sentences is perhaps not quite as restrictive as first seemed the case. On close reading, it seems that community correction orders (CCOs) are intended as a substitute for suspended sentences — or indeed any intermediate sentencing option other that immediate jail. When the Attorney-General commenced the abolition of suspended sentences and introduced CCOs in the Sentencing Amendment (Community Correction Reform) Bill 2011, he spent some time In the Second Reading speech, the Attorney-General spent some time explaining this. The government recognises that jailing an offender is the most serious punishment available. There must be a flexible and practical approach to community-based sentencing that can be tailored to suit the very wide range of offending which, while serious, does not warrant a sentence of imprisonment. This approach is embodied in the reforms introduced in this bill, to which I will now turn. Community-based sentences are an important part of the sentencing spectrum. They provide courts with a way to intervene in the lives of offenders who deserve more than a fine, but should not be sent to prison. A community-based sentence allows an offender to remain in the community. Offenders are able to maintain their employment, live at home and draw on the support of their family and friends. At the same time, offenders are subject to certain obligations — for example, they may have to report to Corrections Victoria, undertake unpaid community work or complete programs that address the reasons for their criminal conduct. The existing range of community-based sentences does not provide courts with sufficient flexibility to directly target the offender and the offence. The combined custody treatment order (CCTO), for example, is rarely used by the courts and intensive correction orders are generally considered an inflexible option. The Sentencing Advisory Council, in the Suspended Sentences — Final Report — Part 2, noted that the overuse of suspended sentences in Victoria is at least partly due to the failings of intermediate sentencing orders. The new CCO introduced in this bill will replace these orders with a single comprehensive and highly flexible order. The bill draws on several recommendations made by the council in its final report to create a new intermediate order. Specifically, the CCO will replace the combined custody treatment order, intensive correction order (ICO), the intensive correction management order (which has not come into effect) and the community-based order (CBO). From the commencement of this bill, these orders will no longer be available to courts in sentencing offenders. Existing orders will continue until their end date. After that time, if an offender is convicted of breaching one of the abolished orders, the court will resentence the offender under the new sentencing framework. A CCO sits between imprisonment and fines in the sentencing hierarchy. The CCO will be available for any offence punishable by more than five penalty units. The CCO will also provide an alternative sentencing option for offenders who are at risk of being sent to jail. These offenders may not yet deserve a jail sentence but should be subject to significant restrictions and supervision if they are going to live with the rest of the community. The broad range of new powers under the CCO will allow courts wide flexibility to tailor their response to address the needs of offenders and set appropriate punishments. Instead of using the legal fictions of imposing a term of imprisonment that is suspended or served at home, the courts will now openly sentence offenders to jail or, where appropriate, use the CCO to openly sentence the offender to a community-based sentence. Unlike the CCTO and ICO, which are technically sentences of imprisonment, the CCO is a community-based sentence. There is no legal fiction involved. The CCO can be combined with a jail sentence, but it will not pretend to be one. The CCO is a transparent sentence that can be understood by everyone in the community: Parliament of Victoria, Parliamentary Debates, Legislative Assembly, 15 Sep 2011, 3291 – 3295 (Attorney-General, Robert Clark). The Attorney-General continued this theme in the second reading speech for the Sentencing Amendment (Abolition of Suspended Sentences and Other Matters) Bill 2013. Because CCOs can now operate up to a period of time equivalent to the maximum sentence for an offence, some of the previous shortcomings of intermediate sentencing orders falls away. In some cases, a CBO or ICO might have been appropriate, but only if it ran for longer than the prescribed periods that were available. It is important to retain a number of distinct sentencing orders to provide well-defined ‘rungs’ in the penal ladder, and to affirm that a sentence of immediate imprisonment is a sentence of last resort reserved for the most serious offences, and for offenders at high risk of reoffending. As I understand it, the point of abolishing suspended sentences and replacing them partly with CCOs is in answer the mental gymnastics required by s 27(3) of the Sentencing Act 1991. (3) A court must not impose a suspended sentence of imprisonment unless the sentence of imprisonment, if unsuspended, would be appropriate in the circumstances having regard to the provisions of this Act. At first blush, it seems odd to hold that it’s appropriate to send an offender to jail after considering and rejecting every other option in the sentencing hierarchy, as required by sub-ss 5(3) and (4), and then turn to s 27(1A) and conclude that it’s not appropriate to send the offender to jail. Whatever your thoughts about that apparent tension and if it can be resolved, the current Government seems to have decided to do away with it entirely. I guess it will take a while for the sentencing jurisprudence to fully incorporate all these changes and reach a settled view. I haven’t yet heard of CCOs being imposed for years — certainly not beyond the old three-year upper limit available in the County and Supreme Courts for the previous community based orders (CBOs). But no doubt there will be cases where lengthy CCOs will be appropriate. 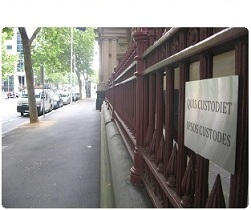 I think of the result as being that if an offender does not go out the back door of the courthouse after sentencing and instead remains in the community, then there will be some intrusive interference in their life on a regular basis, so that they will feel the sting of the penalty on a day-to-day basis while they metaphorically break bluestone. In some cases, that’s probably a far more onerous sentence than a suspended sentence ever was. And, with effect from 1 May 2013, section 48JA of the Sentencing Act 1991 commenced operation (introduced by the Sentencing Amendment (Community Correction Reform) Act 2011 s 58 and amended before its commencement by Courts and Sentencing Legislation Amendment Act 2012 s 71). This provision permits a sentencing court to impose a bond condition on a CCO, where the offender has to stump up some cold hard cash as a measure of their sincerity about complying with the order. The court can specify some or all of that money that the offender will forfeit to consolidated revenue in the event they don’t comply with the order.